Does anyone or has anyone done a modification to the area above the tv? It is such a large space but goes back so far that I cannot reach anything that I would store up there. Thanks! @ Ann - I haven't done anything with that space above the TV in my rig yet. This is just where we store some extra blankets, paper towels and other things we don't normally have to touch during a trip. I have a 1998 carri-lite. 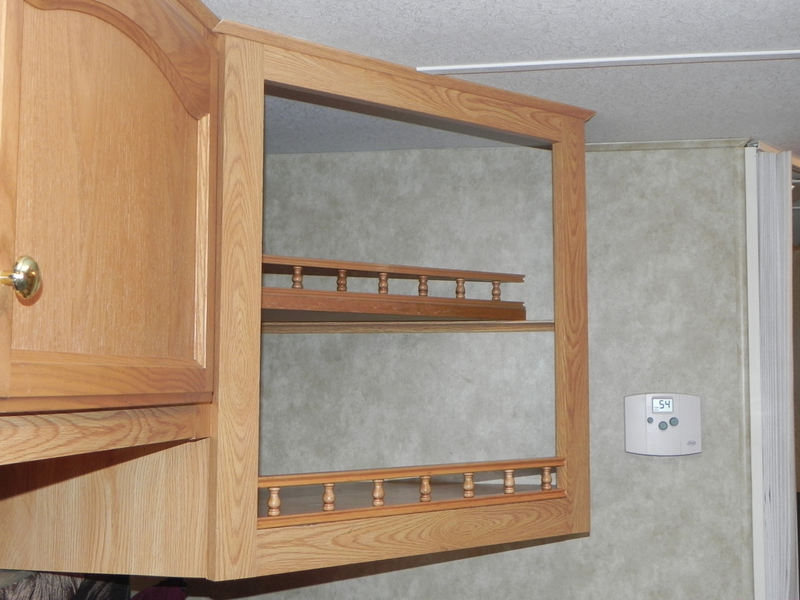 Being an older RV, it had space for a big body TV. Above that space is a mirror and a cabinet that opens in the bathroom. There is a lot of wasted space and the TV is only stable high. I am planning at some point to take off the mirror and mount the flat screen TV at the top and maybe put an electric fireplace in the middle and use the bottom for storage because the breaker box takes up some storage at the bottom. So, maybe you can move your TV up and the storage down a bit. Not sure of your layout. We don't watch TV while camping so wanted to use the space. Fill it with all the junk food!